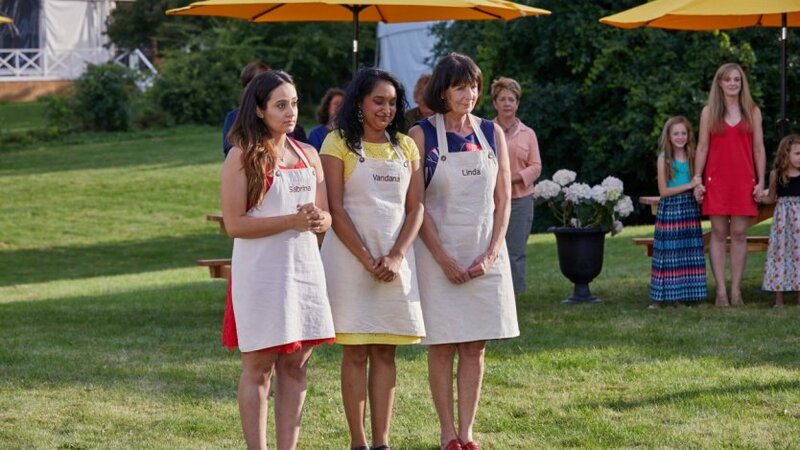 It is the finale of the first ever The Great Canadian Baking Show and who will come out on top. My money is on Vandana. Vandana has dominated week after week. How would I have fared if I made it on the show? I don’t think I would have made it to the finale nor even the semis or quarters, but I know that I might have made it to at least week 3. Hopefully, CBC will renew the show and I can get another crack at showcasing my baking to all of Canada. So let’s get to the finale and who will take home the cake platter. What I would bake: One will definitely will be a chocolate mint mousse cake and the other would be a vanilla strawberry mini mousse cakes. Blueberry Apricot and Strawberry mousse cakes (this one looked really delicious). Rochelle called the strawberry one stunning. Bruno wished it was sweeter. The blueberry one didn’t hold well. Bruno calls it creamy with the right amount of gelatin. Rochelle didn’t taste any blueberries. Passion fruit and white chocolate mousse (infused with Thandai) cakes. Rochelle liked the flavour of the passionfruit mouuse and the other one rich and creamy. Bruno calls the thandai one more of a cheesecake than a mousse. Cherry chocolate and pineapple coconut mousse cakes. What a shame that all of Linda’s mousses collapsed. It looked like Linda filled it up too much. Rochelle noticed that Linda used too much coconut but still like the flavour. Bruno liked the cherry one and Rochelle described it as ugly but delicious. Overall, everyone had some faults to this but the clear winner was Vandana. Linda does have her work cut out for her. The Time: 2 hours and 20 minutes. How I would fare: I have not clue what this is so I think I would come in last. It looked the all three ladies did a successful job at making a Pear Charlotte. In any reality show, there is always an equalizer so the technical challenge equalized everyone. What I would bake: This is daunting. I’ve never made a wedding cake before so I am not sure but if I ever were to get married, it would definitely be something chocolate. Carrot wedding cake. The decorations look beautiful. Rochelle calls the cake elegant and Bruno is impressed that Linda made her own fondant. Bruno and Rochelle thinks the cake is a bit dry. Pink champagne wedding cake. This sounds interesting. Rochelle and Bruno calls the cake beautiful. Rochelle calls the cake delicious and the sponge buttery and the berry flavour stunning. Bruno can’t really taste the champagne. Red velvet wedding cake. The ornate decorations look amazing. Bruno loved the story told through Vandana’s cake. Rochelle liked that Vandana used the glacee work into the cake. Rochelle wanted the cake to be more chocolatey. Colour me shocked. But kudos to Sabrina she pulled it off. I must admit, it was a bit of an upset but Sabrina to learn from her mistakes and incorporated the judges tips so improve her bakes. Congrats to everyone of the ladies and all of the bakers of season 1.